In this final excerpt from The Luminous Dusk, Allison laments that our culture has given up on the concept of heroes – models of how a human life should be lived – and, instead, settled for celebrities. Hebrews II says this: 'They conquered kingdoms, enforced justice, received promises, stopped the mouths of lions, quenched raging fire, escaped the edge of the sword, won strength out of weakness, became mighty in war, put foreign armies to flight.' We should, against the modern habit, hold these for memories, that they might hold us. Our amnesia should not be for heroes, whose virtues are our sunlight, but for their modern usurpers, who represent the ordinary condition of humanity, which so obviously tends toward sin and sloth and mediocrity. Celebrities do not conquer kingdoms, enforce justice, receive promises, stop the mouths of lions, quench raging fires, escape the edge of the sword, win strength out of weakness, become mighty in war, put enemies to flight. Why exchange gold for pyrite?" "But of course the Bible is so much more than a great puzzle book whose secrets can sometimes be unearthed by the reductionistic historical criticism with which, for good or ill, I was indoctrinated in my youth. The inexplicable divine mystery still speaks through the old pages and through my hermeneutical confusion; and in the end I must pursue the book because it has always pursued me. It has made me sing the song of Simeon. It has made known my transgressions so that they are ever before me, and it has freed me from my past so that I am free indeed. It has so shaped my intellect that, even when I do not end with it, I always begin with it. And what little good deed doing I have done has come from memory of the Good Samaritan and the Son of Man's words to the sheep and the goats. I have come to live and move and have my being in the Bible, as also in the Jewish Halakha and Haggadah that illuminate it, and in the history of its interpretation, and in the Christian traditions it has brought forth. I want this book read to me on my deathbed. Despite my modernity and my cynical nature, despite my dissection of it and my quarrels with it, the Bible remains profitable for teaching, for correction, and for training in righteousness. It comforts. It inspires. It commands. When I push its pages apart, I lay my finger on God's heart. I hate to see people not reading it." Dale Allison is hands down my favorite New Testament and Historical Jesus scholar. For me, more than any other author, Allison represents a scholar who is both committed to following the evidence where it leads – even when it leads to uncomfortable places – and maintaining a life of faith. 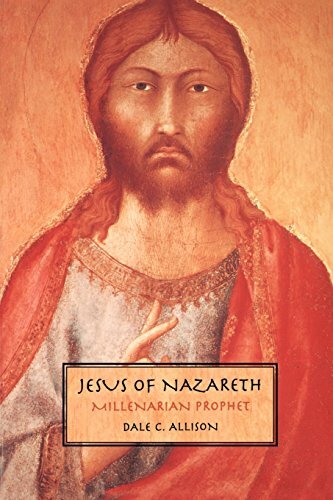 His scholarly work mainly surrounds Historical Jesus studies and he is a, if not the, leading voice of those who promote Jesus as primarily an apocalyptic prophet. In this regard, Allison stands in the line of Albert Schweitzer. 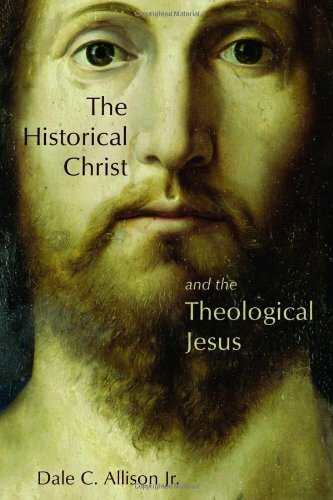 His book The Historical Christ and the Theological Jesus has been, and continues to be, instrumental in my understanding of Jesus and the Christian faith. Outside of Historical Jesus studies, Allison has also written several books about other matters of faith. 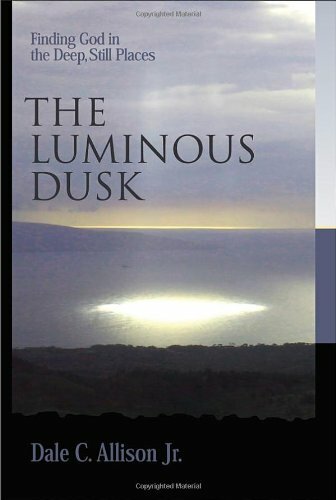 This series will be a collection of quotations from The Luminous Dusk, which contains Allison's reflections on Christian spirituality. "The analysis of divertissement was central to Pascal's thought. It is not difficult to fathom why. Pascal was a Roman Catholic and defender of his faith. The Pensees is in fact an extended defense of the Christian religion, an apology. One of its aims is to expose the sources of unbelief, and for Pascal divertissement was among these. He was persuaded that only those who gaze within and conduct close self-examination, who seek stillness of body and silence of thought, can gain and preserve authentic religion. For Pascal, the God of Abraham, Isaac, and Jacob was to be found when human nature was at rest. The logos was to be heard in the silence, the divine fire beheld in the darkness. Pascal's observation of a link between silence and religion is confirmed by a great cloud of witnesses. The entirety of the Christian tradition is here seconded by the rest of the world's sundry religions, which with one voice advise that faith without quiet is dead. The Koran and the Talmud, the Bible and the Avesta, the Darshanas and the Analects praise silence. Religions are at one it teaching that, without quiet, the roots of piety will at best be shallow. The idea that God speaks not with the wind or the earthquake or the fire but with a still, small voice is a commonplace; it is general religious wisdom. In all places and at all times those longing to touch another world have instinctively known what to do – enter a desert, climb a mountain, join a hermitage." "The foregoing testimonies intrigue me all the more because I personally know a man who claims to have seen a human being transfigured into light. This is not for me a foaftale, that is, it does not concern the proverbial friend-of-a-friend but comes to my ears from someone I know and have no reason to disbelieve (and who has refreshed my memory by kindly sharing with me his relevant journal entry). In 1992 my friend John decided to seek initiation as a Sufi. The process involved having an audience with a Sufi master who was then making a tour of the States. The two men met in a small room for a short period of time. They sat face-to-face in lotus position. No words passed between them. But the occasion was memorable, for John relates that, after a bit, the master began to emit a light, which became brighter and brighter until it lit up the whole room, after which the luminescence gradually faded away, and the encounter was over." These type of "paranormal" events pop up in the mystic traditions with some regularity. In the Hindu tradition, they are called siddhis. What's interesting is that the mystics themselves don't attribute much importance to them. Often they are even seen in a negative sense, a potential distraction from the real work to be done. I don't know what to make of stories like these, but I do find them interesting to think about. I think if I experienced something like this, I would take it as some type of confirmation that I was moving in the right direction. "The miraculous" is not the heart of mysticism, but it seems to be at least potentially related.